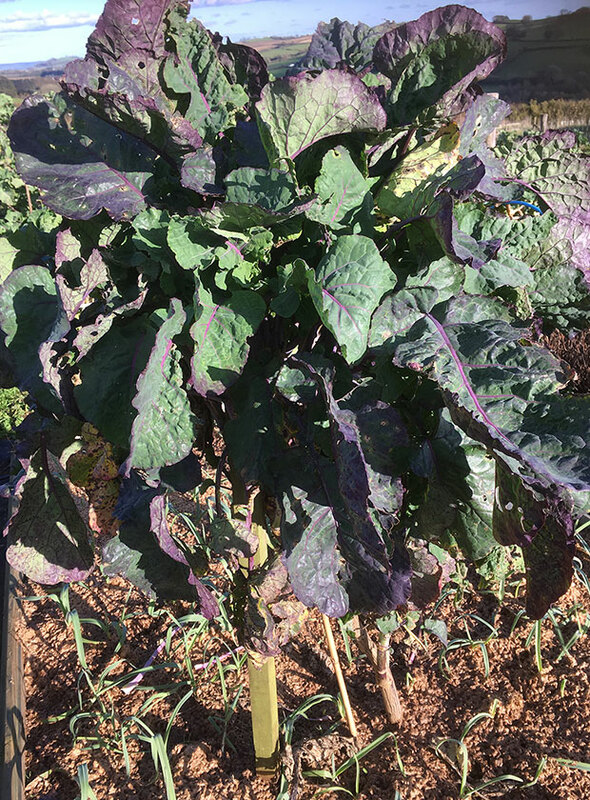 Purple Tree Collards seem to be the most elusive of the perennial brassicas. After waiting patiently for many years, a tiny Purple Tree Collard cutting came our way. We nurtured that little plant and it is now a majestic specimen and we are carefully taking a few cuttings to start propagating these on a larger scale. Our aim is to plant out lots of stock plants so we can begin to offer stem cuttings in the future. From the ones we have made so far, it is amazing to see how quickly they root. 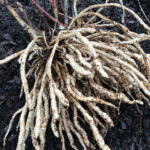 Just snipping off a stem with a growing tip and popping it into a deep pot of compost is all you need to do and within a few weeks it will have started to produce roots. Once planted out, the rate of growth is rapid. You do need to plant out in a sheltered spot, or use a tree stake once they get tall, as they are prone to wind damage. In less than a year, our original tiny Purple Tree Collard cutting has grown from 20cm to nearly 2m. Around the Purple Tree Collards we are planting out, we have planted some perennial leeks and this seems to be quite a good combination. They seem to be happily co-existing. It will be a while before they go on sale, probably 2019/20 is most likely, once our stock plants have established enough. Purple Tree Collards rooting in pots in the polytunnel.